Pumpkin and squash pies may have originally been American favourites but these days they are becoming more popular in the UK too.These sugar free versions make great autumnal dishes and are obviously ideal for Halloween when the flesh from the inside of your lanterns and decorations needs to be eaten up.Pumpkins and squashes can be perfect fillings for sugar free pies as they are already so naturally sweet. Simply add a little honey to give them a boost, spice them up a little with nutmeg, cinnamon and other spices - and your filling has almost made itself! Find a nice ripe pumpkin for this recipe. Ensure you have scraped out all the seeds then cut the flesh away, leaving the skin in tact to shape into a lantern. Pre-heat your oven to 180 deg C/350 deg F/gas mark four. Take a tablespoon of your flour and put it into a bowl with your soft margarine and cold water. Take a fork and gently mash it together until you have a paste. Slowly add the rest of your flour until you have a dough that has a delicate pastry-like consistency. Wrap it in cling film then place in the fridge. Meanwhile, chop your pumpkin flesh into chunks and place in a large saucepan. Cover with water and bring to the boil. Simmer gently until the pumpkin is soft, then remove from the heat, drain and tip into a large bowl to cool. Beat your eggs in a separate bowl. Take your honey and place in a medium pan. Heat gently (stirring all the time) and allow to melt. Slowly add your spices and cream. By now, your pastry should be firmer. Remove from the fridge and roll out on a surface that has been lightly dusted with flour. Grease an 18" pie tin and line with your pastry. Bake blind for just five minutes until the pastry case starts going golden brown. Tip your honey and cream mixture and your eggs into the large bowl with the pumpkin in. Whiz all the ingredients together with a hand blender then pour into the pastry case. Bake in the centre of the over for about half an hour or until the filling is nice and firm. Remove from the heat, allow to cool and serve with more cream. This sugar free recipe is delicious with butternut squash but do experiment with other squashes too. The pie can be served hot or cold. Once again pre-heat your oven to 180 deg C/350 deg F/gas mark four. 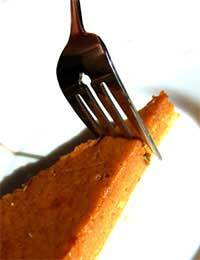 Then, to make your pastry, follow the recipe above for Sugar Free Pumpkin. To make your filling, however, remove your butternut squash flesh, taking care not to include any seeds, chop into pieces and simmer in boiling water until soft. Then place in a bowl to cool. Beat your eggs in a separate bowl. Once again, melt your honey and spices together over a gentle heat. This time, whiz all your ingredients together in a large bowl with your cream cheese and vanilla essence as well. Spoon into your partly baked pastry case and place in the centre of the oven for about half an hour. Remove from the heat when the filling is firm and serve with cream or sugar free ice-cream.